When I first saw this movie in 1982, I left convinced that John Carpenter had produced a complete misfire (especially in comparison to the classic 1951 version). But I’ve come to learn over the years that some movies age well, or perhaps they grow better because we’ve aged and our tastes have changed. 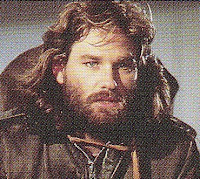 John Carpenter’s The Thing is definitely one of those films for me. It's now required viewing on the first snowy day of winter and has become my favorite among the director’s work. The Thing opens in intriguing fashion with a helicopter chasing—and trying to kill—a lone Husky in the desolate Antarctica snow. The dog runs to the U.S. National Science Institute No. 4, a remote research station. In a bizarre series of events, the helicopter crew is killed and the dog is taken in by the research station’s residents. But this is no ordinary dog. It prowls the station’s corridors stealthily as if stalking its prey. It spies silently on the residents. It’s afraid to join the other dogs, which snarl at the newcomer viciously. Seeking an explanation for the helicopter crew’s unusual behavior, McCready (Kurt Russell) and Doc (Richard Dysart) trace its origin to a Norwegian research facility. They discover frozen corpses and a strange, partially buried “thing” that could be human. Back at the U.S. station, an alien creature reveals itself for the first time by mutating out from inside the Husky (a fairly gory scene). With the creature’s ability to imitate other life forms established, the film’s premise is finally set into motion. If the alien can be anyone of the research station’s crew, how can it be stopped? The seriousness of the situation worsens when one of the scientists models the alien’s ability to infect humans. He determines that if the “intruder organism” reaches the general population, it could take over the planet in 27,000 hours from first contact. The plot is supposed to be closer to John Campbell’s short story "Who Goes There?" than 1951’s The Thing (see Aki's nifty review from earlier this month). But, truth to be told, this is a mystery masquerading as science fiction. A murderer is among a group of people at a remote location—isn’t that the plot of Agatha Christie’s Ten Little Indians? The twist here is that the killer can reveal itself and then hide again by assuming another identity. The film’s best scene is when McCready devises a test for revealing the alien’s identity. This tense setup also recalls the classic mystery climax where the detective calls together all the suspects and unveils the murderer. Subsequent viewings of The Thing allow one to appreciate its smaller pleasures: Ennio Morricone’s suspenseful electronic score (which has a definite Carpenter sound to it); an open ending that actually works (usually I loathe them); and Kurt Russell’s solid performance (less cartoonish than in Carpenter’s Escape from New York and Big Trouble in Little China). Still, it’s the remote locale and the “who is it” premise that makes The Thing so entertaining for me. Other films have featured aliens who could take human form (most notably, the original Invasion of the Body Snatchers and cult classic The Hidden)—but this one remains my favorite. This movie had me on the edge of my seat when I first saw it. Granted a six year old probably shouldn't watch this movie but still it was really a good and actually scary movie. After reading your post I actually want to watch the movie again so I'll have to find it and stream it to my phone with my Sling Adapter. I heard through people I work with at Dish Network that they are making a prequel for this movie about the team that actually found the spaceship. I hope that will be as good as the 1982 remake. The real Special Makeup Effects and Puppetry FX is ninty times twice as better than CGI. I think they should keep making more horror films similar to this movie, and continue using real makeup fx and puppetry fx. 'THE THING' (1982) is one of my favorite horror sci-fi mutant films. Hope they will make fifty more 'the thing' movies soon, and love to see twenty more guys transform into huge alien monsters. Rob Bottin's special effects are very awesome work for this movie 'the thing.' If theres any other good professional directors, producers, and special makeup effects co-produers around I really hope they'll make thirty to forty more sequals about 'the thing,' of course use the real makeup fx, puppetry fx, and maybe add a lot more makeup air-bladders fx. They should make more movies like this one! There will more effects, thanks to the technology advancements. This one was just epic! Thanks for stopping by. This is a scary movie. This is an awesome movie. And I really wish to see more like this one! The remake was bad, bad, bad.